Chronic Wasting Disease Confirmed In Stone Co. 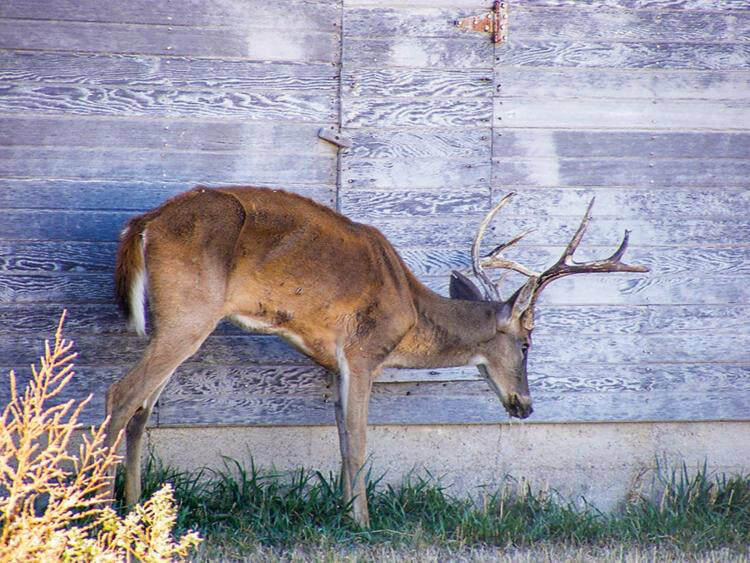 Chronic Wasting Disease in a deer in Kansas. Photo Credit: Mike Hopper, Kansas Department of Wildlife, Parks and Tourism. Missouri Department of Conservation (MDC) reported last week that CWD was found in a deer harvested in Stone County for the first time. This report, dated Friday, November 30, states that the deer was a young buck that was taken on private property outside of Reeds Spring. Now that CWD has been identified in the southwest portion of the state for the first time, MDC will carry out the next portions of their CWD response plan, including potential expansion of CWD management practices to surrounding counties and a potential post-season targeted culling in the immediate area around where the deer was harvested. Chronic Wasting Disease (CWD) is an illness in deer that causes, essentially, holes in the brains of the animals, often leading to odd behavior and weight loss in the animals. CWD is fatal in all deer that it infects. Jasmine Batten, Wildlife Disease Coordinator for MDC, said, “This deer was detected during mandatory sampling opening weekend.” As part of the Chronic Wasting Disease detection protocol, certain counties in the southwest part of the state, including Stone and Barry, have been subject to increased regulations on deer, as well as mandatory sampling of all deer harvested the first weekend of regular firearms season. Until last week, CWD had only been found in Missouri in the northeast and north central portions of the state, including St. Claire, Cedar and Polk Counties, which are the closest in Missouri to Stone County. However, “The closest cases to Stone County certainly are the ones in Arkansas,” Batten said. Since around 2016, nearly 400 cases of CWD have been identified in northwest Arkansas, primarily in southeast Carroll, southwest Boone and all of Newton counties. Carroll County, Ark., is directly south of Stone County, which is the primary reason Stone County is in the mandatory sampling zone. A detailed map of where CWD has been detected in Arkansas can be found online at https://www.agfc.com/en/hunting/big-game/deer/cwd/cwd-arkansas/. What will change for hunters in Stone County? Now that CWD has been detected in Stone County, all of the previous management practices, including the bans of feeding deer and the use of mineral licks, will remain in place. The management zone will likely expand to include additional counties next year. “The management zone has typically included counties within 25 miles of a CWD case. So, for next year, we might be adding a few counties to that zone,” Batten said. “For most hunters, those are the biggest changes we are looking at,” she said. Within one to two miles of the area where the deer was harvested, MDC may carry out additional steps to, hopefully, prevent the establishment of the disease in the county. “Due to the nature of the disease, once it is established in an area, we are really unlikely to actually eliminate it. We don’t know if you can actually eliminate it or not, once it is well established,” Batten said. Chronic Wasting Disease is what is known as a prion disease. Prion diseases are spread by misshapen proteins that attack the brain and nervous system in affected animals. “The agent that causes CWD [the abnormal proteins], are very robust to being degraded,” Batten said. “They are resistant to really high temperatures; they resist freezing and thawing as well. They resist typical disinfectants, so they can be infectious for a long time in the environment,” she said. CWD is shed into the environment by the saliva, urine and feces of infected deer. This is the reasoning behind the bans on feeding and salt licks; the disease can be shed from the infected animal into the environment, where it can infect other animals that use the same salt lick, for example. Parts of the carcass can also spread the disease, so hunters are encouraged to use caution when moving deer parts, either leaving them at the harvest site or disposing of them in a landfill. “Hunters hunters should be aware that the carcass from an infected deer can spread the disease, so we encourage hunters anywhere not to take carcass parts and move them a great distance and throw them in the landscape. But we really like to encourage hunters in an area where they know we’ve found CWD to take a little care with those deer parts,” Batten said. In order to hopefully prevent the establishment and spread of CWD in Stone County, MDC will follow their established response plan by setting up the targeted culls in the immediate area surrounding the positive. These post-season culls will only be undertaken with landowner permission and details will be worked out in coming weeks. “We’ve been following [this plan] in all areas where we find the disease,” Batten said. “But, participation is entirely voluntary. We’re not harvesting deer from people’s property that don’t want us to be there,” she continued. After these voluntary culls, all deer harvested are tested for CWD. For those that come back negative, the meat is either returned to the land owner, or if they do not want it, it is contributed to Share the Harvest, according to Department of Conservation information. These CWD management practices have worked in the past in at least one case Batten was able to share. “We had a single case in a county in central Missouri years ago. We worked with landowners of a couple of years, did the targeted culling, and we haven’t had any additional cases. So, we’re a little optimistic there that there’s a chance if you get in there early enough you can kind of stamp it out. But, the likelihood is still small,” she emphasized. What should hunters do now? MDC still recommends hunters participate in voluntary CWD sampling when they can. In Stone County, hunters can take their deer to be sampled at Pete Dickenson Taxidermy, located at 20646 Old Hwy 160 in Reeds Spring. The phone number for the taxidermy shop is (417) 527-0695. Voluntary sampling will also be performed free of charge, but hunters will have to work within the capabilities and requirements of the taxidermy shop. They are subject to whatever the normal hours are and capacity to honor those requests. There is another option, however. “If hunters have a hard time accessing that source, they can also save the head from their deer and keep it cool or even freeze it and any of our [MDC] regional offices will take a head and sample it as well. It may be a little more effort or travel a little further, but that’s another option for hunters that are concerned,” Batten said. Further, if hunters or other individuals see a skinny deer that is acting strange, it may have CWD. “I would just say, folks can be on the lookout for sick deer. If they see deer that are extremely skinny and acting weird, those can be some of the markers for CWD. We do welcome reports either to your local MDC office or to your local conservation agent. That’s one way we can detect CWD in the landscape. I encourage hunters when they can to participate in CWD sampling. And just add that we greatly appreciate the continuing participation from hunters and landowners, because we couldn’t do it without them,” Batten said.